To celebrate I’m holding a competition for the chance to win one of five signed copies. To enter simply email me at anthonyryan27@hotmail.co.uk between now and midnight GMT 29th June. Mark your email ‘Blood Song Paperback Giveaway’. Non-US contestants are welcome. I will choose the five winners at random on 1st July and I’ll email them for address details. Each winner will receive one signed US mass-market paperback edition of Blood Song with a personalised dedication. P&P will be paid by me. All addresses supplied will be deleted at the close of the competition. Only one entry per contestant please, multiple emails from the same source will be banned and the sender blocked. Best of luck. Goldsboro’s stock of Blood Song sold out in a matter of days last year so you may want to order early to avoid disappointment. You books will be mailed off by the end of next week. Enjoy. Commiserations to everyone else but stay tuned for another competition when Tower Lord comes out in July. 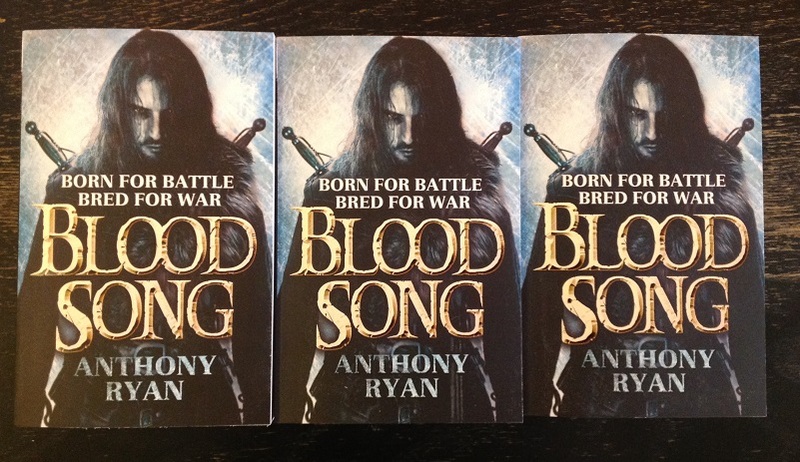 To celebrate the UK release of the Blood Song paperback I thought I’d hold a giveaway competition. To enter simply email me at anthonyryan27@hotmail.co.uk between now and midnight GMT 28th February. Please include your name and address in the email – non-UK contestants are welcome. The three winners will be chosen at random on 1st March and will each receive one signed UK mass-market paperback edition of Blood Song with a personalised dedication. P&P will be paid by me. All addresses supplied will be deleted at the close of the competition. Only one entry per contestant please, multiple emails from the same source will be banned and the sender blocked. Good luck. For those who missed out on the Goldsboro Books offering, Analecta Books have some more signed hardcovers of Blood Song for sale. No idea how long they’ll stay available so order quickly if you want one. I was hoping to announce that signed, stamped and numbered copies of the UK hardcover edition of Blood Song would be available from Goldsboro Books in London, but sadly they sold out of all 100 copies on pre-order before I realised it had been listed. However, they tell me they’ve ordered another 50 copies for me to sign, although these won’t be numbered. These will be sold on a first come first served basis so, if you want one, place your orders now: http://www.goldsborobooks.com/search.php?q=blood+song. Also, I’m now on Twitter if anyone would care to massage my ever fragile ego with a follow: @writer_anthony.